Last week we received a notice from the council outlining the charges for our allotment plot for the next year. Thankfully we already knew that for this year there was going to be no rise in the charges. This means we can look forward to another year of enjoying the health and financial benefits of growing our own fruit and vegetables. With the future still uncertain over Brexit, fluctuations in currencies and inflation at its highest since July 2014 the cost of food has been steadily rising. Many people have questioned if it really is cheaper to grow your fruit and vegetables. Last year we found that throughout the whole summer and autumn we didn't buy any soft fruit as the allotment provided us with so many red and black currants, raspberries plus also rhubarb that we didn't know what to do with all the produce. After we had eaten them raw, preserved as jams and jellies and then made desserts such as summer pudding we still had more left over. This year we will be more organised! One luxury we were able to have was raspberry crumble. I calculated that the amount of raspberries in it would have cost around £10 in the local supermarket! Suddenly the simple act of growing fruit on an allotment turns in decadent living. Once you start growing at home it's hard to go back. 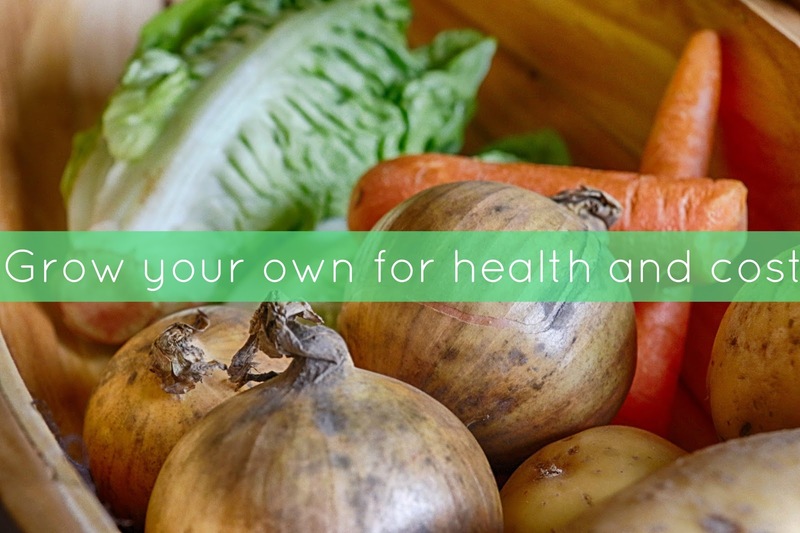 Health wise there are so many benefits in growing your own. Not only do fruit and vegetables retain so many more vitamins and minerals if picked and eaten fresh but it also encourages you to eat more healthier overall and cook meals from scratch. Eating a good portion of fruit and vegetables each day can lower your risk having a stroke, heart attack and some cancers according to the World Health Organization (WHO). Of course with our large allotment plot it's very easy to extol the virtues of growing your own food. However for years now we have been growing our own herbs, fruit and vegetables either inside or outside in small plots and pots. Whatever the size of your gardening space you can always grow something. If you're looking to grow your own food this year here's three to start out with. Potatoes – There's many types of potatoes which are classified by the time of year they are planted and their variety. Your standard white potatoes which can be used for roasting, baking, frying and mashing may be cheap to buy but new and salad potatoes can be quite expensive. This year we have seed potatoes that we will be chitting first and then planting in the ground. If space is at a premium try growing them in a potato sack that can be kept on a patio or even a balcony. Tomatoes – One of the easiest seeds to start growing at home. You can either start them in trays and then thin them out or plant individual seeds in pods. Once they have germinated pick the strongest seedlings to pot on. Tomatoes love being warm so pick a sunny spot either in a greenhouse or a window sill to grow them. Now is great time to start buying your seeds to get a harvest later in the year. Peas – After eating homegrown peas straight from the pod last year I decided to grow them myself this year. There are several ways to start them off but one way is to plant them in old loo rolls which can then be planted straight into the ground. Do you grow your own fruit and vegetables? Have you thought of growing food in a small space? oh I would so love to grow my own. We are lucky to have an allotment area nearby but there is a long waiting list for a plot. I should get my husband to put his name down for the future. So far the only thing I can grow is my own herbs, but it's still lovely popping into the garden to grab something wonderful to add to our food. It's a start isn't it?